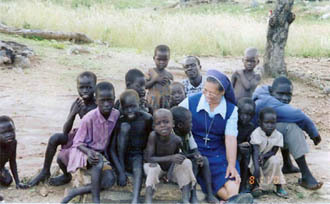 Sr. Marie Jose Gracia, with some children from one of the refugee camps in Adjumani, Uganda. Sr. Marie Jose Garcia, SSpS writes about her own experience of designing a space for Sudanese women in a refugee camp in Uganda. 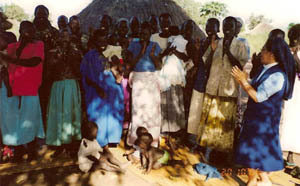 Part of women empowerment: Sudanese women refugees of Adjumani, northern Uganda come together on weekly basis. I am presently doing pastoral work among the Sudanese refugees here in Adjumani, North-ern Uganda. I accompany and support the refugees in different ways, assisting the cate-chists and the local church, visiting refugees in their homes, listening to their stories and pray-ing with them. Recently,I started Women’s Program in the different camps, just to allow women refugees to form support groups with the intention of empowering them. I am deeply encouraged with the response of the women. I must say it was beyond my expectations. I now have groups in 5 camps and a few other camps are still waiting. The groups come to-gether for weekly sharing in their respective camps, sharing their concerns and finding mutual support. I usually facilitate their interaction with different activities such as self aware-ness, team-building, peace and reconciliation and/or stress management through simple breathing exercises or yoga. They really ap-preciate these activities and the opportunities for them to come together. We have started small income-generating activities in 3 camps and they are quite happy, although it’s not bringing them so much income. Each group chooses its own leaders who meet on a weekly basis. I attend their meetings as a kind of support. The leaders of the different camps come together once every two months for on- going formation and mutual sharing. Sudanese refugee children in the primary school from Adjumani refugee camp, Uganda. The women are my constant inspiration. I honestly say that I receive more from them than I could give. My constraint is that I don't speak any of their languages. In some camps they have as many as 18 languages. Not so many can speak or understand English, so I depend very much on the few who could do some translations. How true it is that the lan-guage of love is the one language that all people understand. 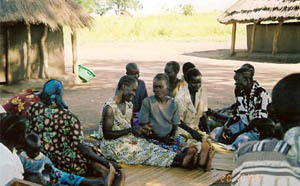 Sudanese women refugees in one of the human development workshops. Adjumani refugee camp, Ugnda. The refugees here asked me to convey to our congregation and our sisters their gratitude for allowing me to be here. There is so much talk about repatriation. Some of them are asking if I am going with them when they return to Su-dan. 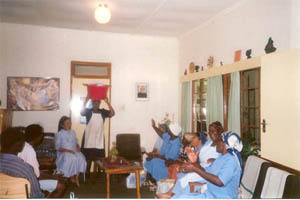 Through this sharing I would like to ex-tend my deep gratitude to our congregational leadership team for their trust in allowing me to work here and to my sisters in Botswana Region and to all of you my sisters for support-ing me with your love and prayers, especially my sisters in the Philippine Province. Thank you and God bless you all. May Mother Jo-sepha continue to inspire us with her life and love. Household Christmas Party: We gather with the women who help us with our household chores (cook and others) for a Christmas party. Our small gifts will help their family. 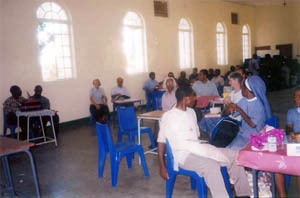 Co-Workers Chistmas Party: The priests, Brothers and Sisters working in the Vicariate of Francistown gather before Christmas to share the Eucharist, socialize, and exchange gifts. This fosters good working relationships within the Vicariate.